We are nominated for an Urban Food Award! A whopping 80 London based enterprises are in the running across four categories (Best Retailer, Educator, Producer, Eatery) - the three with the most votes going through to a final round where a panel of experts will decide the winners. You've got until October 31st to vote - so spread the word and get voting! 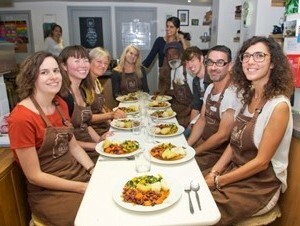 Made In Hackney runners aiming to raise over £4000 for our new Community Cookery School in Clapton Commons! 11th April 2019 Meet our Hannah - NHS dietician, vegan long distance runner and MIH powerhouse! 10th March 2019 Will you run for us in the Hackney Half Marathon on 19th May? 1st February 2019 What's It Like Being a Volunteer for Made in Hackney? 16th July 2018 What's It Like Teaching At MIH? 12th June 2018 The return of the Community Food Forum! 1st June 2018 Vegan Cheese Party! 18th April 2018 Community Food Forum is Back! 9th April 2018 "The Kitchen's The Place To Be"
2nd March 2018 Will you run for us in the Hackney Half Marathon, on 20th May? 6th February 2018 Job Vacancy Alert - Enterprise Manager! 31st January 2018 MIH receives charity status and a new Board of Trustees! 29th January 2018 I got a job! 20th December 2017 You CAN teach an old dog…. 23rd October 2017 Our Crowdfunder is Live! 26th July 2017 Apprenticeships at Made in Hackney up for grabs! 19th July 2017 The MIH Ted Talk Goes Live! 30th May 2017 I feel like I've finally found my tribe! 10th May 2017 "Usually I'm introverted, but volunteering at classes has been a good way to talk to people." 12th April 2017 The Hackney Half Marathon - how to cross the finishing line in one piece! 16th March 2017 Want to run for us in the Hackney Half Marathon? 15th February 2017 "I've not felt this well in years." 8th January 2017 January News -Herbal Latte & Green Smoothie recipes and more! 24th November 2016 Would you like to become a Trustee? 18th November 2016 Help us win £10,000! 26th April 2016 Pesticide Free Hackney. Because we're worth it! 5th April 2016 More fabulous cookery teachers needed! 26th February 2016 Community Food Forum draws the crowds! 4th January 2016 Come Run with Us! 14th December 2015 A Stinging Introduction to Eating Nettles! 6th November 2015 Apprenticeship at Made in Hackney Up for Grabs! 20th October 2015 Are you a budding writer? 19th October 2015 Tickets still left for our fundraising dinner extravaganza on Tues 29th Sept! 2nd March 2015 Welcoming Deaf Plus crew in MIH Kitchen! 16th February 2015 IT People Needed! 18th November 2014 More fabulous cookery teachers needed! 21st October 2014 We are nominated for an Urban Food Award! 11th September 2014 Stop Press - MIH In The News! 20th August 2014 Where To Buy Local and Organic Food? 7th August 2014 How much can a survey tell you? By Lucy Rhodes,Project Apprentice Made in Hackney. 23rd June 2014 Fashion designer Katherine Hamnett leads calls to ban dangerous herbicides in Hackney. 1st May 2014 We did it! Made In Hackney Hits Crowdfunding Target!